An extremely consistent instrument, with quality at the fore. Excellent attention to detail throughout. Near flawless build quality. Highly playable for both strummers and fingerstyle. Lovely modern acoustic tones. Decent value. You might struggle to find a pickup system. 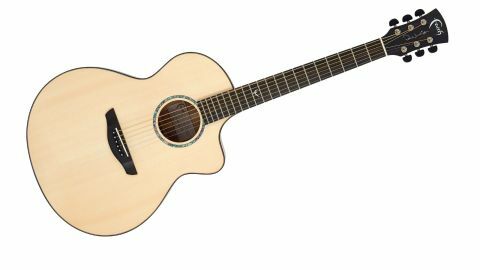 Of the many UK-designed acoustic brands, Faith has a major trump card: its instruments are designed by Patrick James Eggle. The revered maker has been associated with the brand from around two years after its launch in 2003. While Patrick's own line of high-end acoustics and new electric guitars come with hefty price tags, the Faith guitars are made in Indonesia and thus occupy a much more real world slot in the guitar market. "Care has clearly been taken with choices of wood throughout and Macassan figured ebony is paired with the London plane"
The PJE Signature series currently consists of four models that all use back and side woods indigenous to these fair Isles. As with Patrick's latest electric project, Fenland bog oak is featured on the two Mars Signatures, while this Neptune 'baby' jumbo uses similarly unusual woods. Our cutaway Neptune uses a more left-field choice for its solid back and sides: London plane. In recent years, it has occasionally been used by early instrument makers, but we can find no reference to it being used in the world of modern guitar making before this signature. Wood choice asides, it's immediately apparent that there is a great deal of really nice craft in this instrument. It has an invitingly classy look evidenced by the super tidy neck binding, the small dot position markers along the edge of the fingerboard, and the mother-of-pearl logo inlaid into the ebony fingerboard at the 12th fret. Care has clearly been taken with choices of wood throughout and Macassan figured ebony is paired with the London plane. Faith says that London plane, "when matched to high-grade Englemann spruce, produces a tone that is crisp and clear with a sound akin to sapele and other mahogany variants". "The 55mm string spacing at the saddle means fingerpicking - even for those of us with fatter digits - is a pleasure"
It doesn't suggest itself a first choice for a solo instrumentalist, but playing in an ensemble we find a tightness and power that really maintains its presence. It's also satisfying to strum and demonstrates a broad range of subtle tonal shades and dynamics as we experiment with different types and thicknesses of picks. There's a suggestion of grunt in the lower mids, but it also sounds airy and open, which is particularly noticeable fingerpicking in a drop tuning. All the notes of even harmonically dense chords are nicely audible, but when playing inversions in upper positions, the top strings showed up this cutaway as sounding a little bit thin. Still, there's a confidence-boosting weight and scale to the handling. It feels solid but not chunky. The high-glossed mahogany neck has a good depth and sort of rounded 'U' profile, giving a sense of substance and comfort. The 55mm string spacing at the saddle means fingerpicking - even for those of us with fatter digits - is a pleasure. The action is set fairly low on our cutaway guitar, and seems set to accommodate hearty strumming and easy capo use without fretbuzz, but remains low enough to enjoy the snap of string on fret, John Martyn style, with the gentlest extra pull. A bigger, higher fret wire is helpful here, too: it lessens friction between the finger and the 'board when bending and makes for an easy swap between electric and acoustic mid- set. The Grover tuners are smooth and responsive, so tuning between regular and relatively extreme open tunings was drama free. All good! As we're seeing throughout the industry, different woods are increasingly being trialled, and on the evidence of this guitar, if you like a modern balanced voicing as opposed to the earthier grunt of your vintage Martin, then add London plane to the list. Yes, it certainly leans on the Taylor side in terms of voicing, but not in price: you simply won't get this all-solid specific at these prices from our friends in San Diego. So, pro-spec guitars for the real world musician? We think so.